This unit is made to hold 7 wine bottles and 6 long stem wine glasses perfectly, and Shipped in the USA. √● Space saving, super practical is its biggest advantage, because it can not only put 7 bottles , but also can hang 6 Glasses Stemware ! √● Solid and strong is its second highlight! After installation, it will not shake on the desktop! Durable! 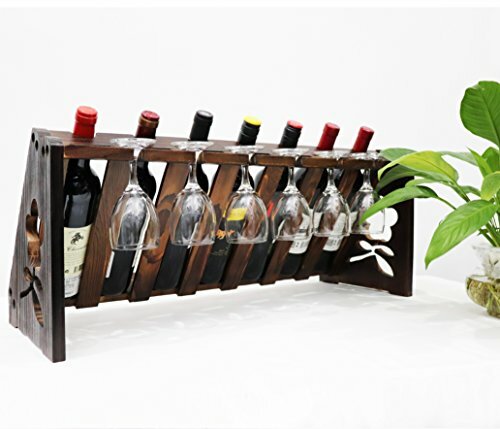 Its structure is a triangular bracket, supporting 7 bottles is absolutely very stable! √● Parts of the product are carefully selected, not ordinary small screws, will not rust! Screws are thick and strong!The normal service life can reach at least 10 years! √● Solid wood, pine! Color is the most classic walnut color, this color is not exaggerated, does not fade, classic match! √● Applicable to the living room, kitchen, wine lovers, bars, parties and other occasions! Elegant style, high quality! √● Installation is very simple! All the tools are in the package and it takes only 10 minutes to complete the installation. The packaging is very good and very strong! Suitable as a gift! ★★ Each product is selected by our carpenter master, polished, grooved, colored, QC, packaged, and then delivered to your hands. Each step is carefully completed, each product is passed through Strictly selected! 【Super Features】 Support 7 bottles and 6 Long Stem Glass ! Very convenient and practical! Suitable for occasions such as the living room, kitchen ,bar, very high-end atmosphere and practical! 【Super Stable 】 solid wood! Will Not shake! Safe！ Triangle bracket design, standing very stable! The cup will not fall, the cup slot design is accurate! Easy install , simple and it takes only 10 minutes to complete it. There are all the tools in the package! 【Forever Classic American Walnut Color 】The color texture is very good, not exaggerated, super classic! Does not fade, odorless, non-toxic, environmental health! Fine workmanship, does not hurt the skin! 【Super Quality】 The quality of this product can absolutely satisfy the customer. The normal service life can reach at least 8-10 years!